Shortly after I moved, one of my friends asked me when I was going to make a menu plan again. “After I finish unpacking,” was my reply. However, wandering the aisles of my new grocery store (I love you, Seven Mile!) with considerably less focus than usual was not super pleasant, or productive. Cue heroic music, enter the menu planning. I’m not quite organized enough to plan for the whole month, but I will share my plan for this week (I was also going to share my plan for last week, but I used the back of it for my shopping list and it is now MIA. Sorry). One, my husband bought me a new cookbook for my birthday (awww, isn’t he great?). 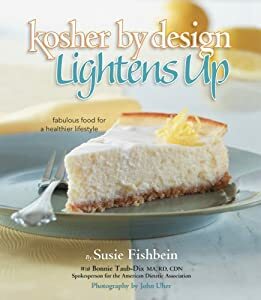 He got me Susie Fishbein’s Kosher By Design Lightens Up. I had wanted a kosher cookbook that was on the healthier side (read: no onion soup mix in the recipes, no deep-fried Chinese food recipes which I would wistfully ignore). So far, I really like it. Two, until very recently (like, Motzei Shabbos), all my books were packed. The only reading material I had access to were my friend’s old copies of Binah (thank, E!) and my two years’ worth of Bon Appetit magazine. So, I’ve been poring over many scrumptious and sumptuous recipes as well as educating myself on various foodie facts (did you know that this is the peak season for pluots? Me neither. I don’t even know where to get one, or what it is exactly!). Jesting aside, I do love that every month, Bon Appetit picks a food at its seasonal peak and provides several delicious ways to prepare said food. Also, the recipes for each month are appropriate for the season, which is something that I do want to become more familiar with. Three, my mother is in town (yay! ), so I am actually able to potchke around in the kitchen as she enjoys her grandmotherly privileges. Ultimate Veggie Burgers ~ Kosher by Design Lightens Up (KBDLU); Oil and Vinegar Potato Salad ~Bon Appetit, July 2009 (BA 7/09) – it was sooo yummy, and I was able to pop the leftovers in the freezer for next week! Everything from the night, minus the fish and soup, and add cholent and liver (store bought, that). Yum! Now, I do make a different thing every night, and my good friend, E, mentioned that she likes to make double and serve the same thing two nights in a row. It sounds like a good plan to me, and since my children aren’t old enough to protest, and my husband is okay with leftovers, I may adopt this plan. What I’ve done in the past is freeze the double portion and bring it back out a different week. I have to decide which plan I prefer, I guess. For those of you who menu plan, how do you factor in your leftovers? Previous Post Teething is a Pain. Literally. I never make recipes that require onion soup mix or similar items; they sound far too unhealthy. I own “Healthy Helpings” and have used it quite a lot. What were the “ultimate veggie burgers” like? Healthy Helpings, eh? I’ll have to add it to my wish list. The Ultimate Veggie Burgers were incredibly delicious. They included mushrooms, brown rice, fresh basil and oregano, white beans, sweet potato and carrot, and had a very rich and satisfying taste. Plus, the recipe yielded enough that I have leftovers in my freezer! I love that. Wow, that’s really impressive that you are already up to menu planning – good for you! It’s not something I’ve ever gotten to…maybe one day. About leftovers, it gets put in the fridge and eaten up another day for lunch/snack since I don’t have that much leftover after the meals. I cook pretty much according to the amount I need each night. Great menu plan. You can check out my plan at koshymommy.blogspot.com. As for leftovers, I usually leave in fridge and eat for lunch during the week. Glad you are enjoying 7 Mile!